It has been 25 months since my last band post. I do not know why, and such behavior is inexcusable. Summary: Few things piss me off more than when someone refers to the Pet Shop Boys as a "one hit wonder." First of all, they had a lot of big hits in the 80s, not just one. Second, they have continued making cutting edge dance music since they started, and even today they are making brilliant music. For catchy, clever, ironic silliness, the Pet Shop Boys deliver supreme doses of excellence. A Brief History of the Artist (from AllMusic): Postmodern ironists cloaked behind a veil of buoyantly melodic and lushly romantic synth pop confections, Pet Shop Boys' cheeky, smart, and utterly danceable music established them among the most commercially and critically successful groups of their era. Always remaining one step ahead of their contemporaries, the British duo navigated the constantly shifting landscape of modern dance-pop with rare grace and intelligence, moving easily from disco to house to techno with their own distinctive image remaining completely intact. 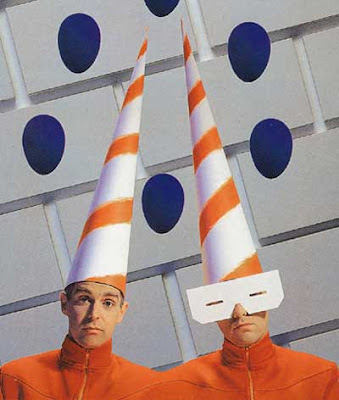 Satiric and irreverent -- yet somehow strangely affecting -- Pet Shop Boys transcended the seeming disposability of their craft, offering wry and thoughtful cultural commentary communicated by the Morse code of au courant synth washes and drum-machine rhythms. 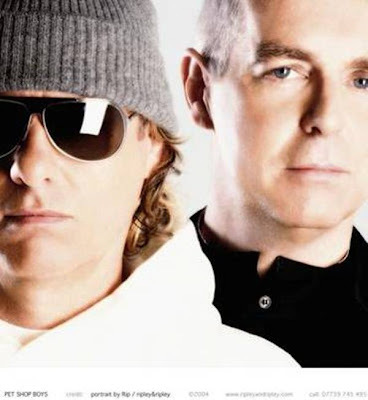 My History with the Artist: As I sit here thinking about the Pet Shop Boys, I realize that they have been a consistent part of my musical life longer than any other band. In fact, here is a bold statement: I have been a serious, consistent fan of Pet Shop Boys longer than I have been a fan of any other group. This is true. 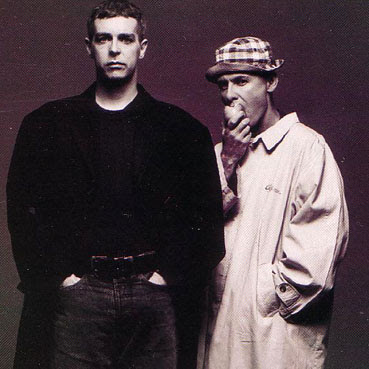 I started liking the Pet Shop Boys from the moment I heard their first single, the 1986 classic "West End Girls" -- that was 23 years ago, when I was in middle school. As I have mentioned before, my middle school years were mostly focused on Top 40 pop, so I heard the song on the radio. But I thought it was completely different from anything else I had heard. I also loved their follow-up hit, "Opportunities," so I bought the album Please from Columbia House Record Club. I was hooked. My favorite song on the album was the amazing "Suburbia,"which I thought was powerful and evocative, though I may not have used the word evocative in 1986. Their second album, Actually, was also a favorite of mine, with the sweet dance cover of "Always on My Mind"--which I would request religiously at middle and high school dances that year--and the wonderful Dusty Springfield duet "What Have I Done to Deserve This?" The album also contained one of my even-today favorite PSB songs, "It's a Sin." Around this time I came to realize how much I like the concept of the remix. PSB released the album Disco, which was a remix album of previous hits, and I relaly loved the reinvention of previously loved songs. And then came Very . . . When I was spending my semester abroad in Scotland, PSB released their greatest achievement, this stunningly great collection of disco-pop gloriousness. Every single track on this album, from the tongue-in-cheek silliness of "I Wouldn't Normally Do this Kind of Thing" to the "why-did-she-tell-people-I'm-gay" plotline of "Can You Forgive Her?" Very is a classic and a masterpiece of synthesized melodies. When I was in college, I dj-ed many of the big all-campus parties, and I feel proud that I helped introduce PSB's stellar "Go West" to the college population. This song became a staple of my parties, and soon the whole population of the Harris Center (where the parties took place) was dancing in unison to a self-created choreography during the chorus of the song. The move basically involved everyone raising arms in the air and pointing west while hopping that direction as well. It all looked very awesome when the whole room participated. Anyway, I think this song "Go West" will forever be linked in my memory to dj-ing at the Harris Center. So my love of the Pet Shop Boys continued, through their next albums and up through today. Their early greatest hits album Discography is a top-notch collection. They have never hit the U.S. charts like they did in the 80s, but they have had 22 Top 10 singles in the U.K. They been a constant fixture of club music and have never disappeared. They have been cutting edge in terms of image, production, and cleverness. They make silly and fun videos. And they have written a song about Eminem having an affair with an adoring male fan ("The Night I Fell in Love), and a song about Tony Blair's relationship with George W. Bush ("I'm with Stupid"). They have a new album this year, and the first single is vintage PSB. I will be reviewing the new album soon. So, the Pet Shop Boys have the honor of being the group I've been a fan of the longest, and since I won't stop being a fan, they will never lose this distinction. Too much music, not enough Reed Johnson robbing grand slams in the blog these days. i'm just looking forward to the decemberists and the death cab for cutie posts that should be coming. I'm glad the band posts are back. Even if I'm not fan of the band being discussed, they're always very entertaining. I enjoy hearing how the band related to your life. Please tell me these will be a somewhat regular feature again, not put on another two-year hiatus! I will definitely try to keep them more frequent. I didn't wanna wake you up . . .